Trinity Designs: Allow Me to "WELCOME" You to my Team! With this "Simply AMAZING" Offer from Stampin' Up! 16 DAYS ONLY - Stampin' Up! 's FULL SIZE Starter Kit is HALF-PRICE! Just $87.50 with FREE Shipping! Merry Christmas Early - WOW.. that is no typo in the headline! You can join my team NOVEMBER 15-30th for just $87.50 - that's the full, usual $175 kit for just $87.50. This special is for anyone and everyone and includes previous demonstrators. As a regular reader of my blog - you know that I LOVE what I do and LOVE being part of Stampin' Up! I would love to share with you about how I can help you have as much fun as I do. 1. 50% savings - AMAZING! 3. On December 1st - all demonstrators get to pre-order from our Occasions Mini and Sale-A-Bration Catalogs. Save 30% or more on new stamps, ribbon flowers, pom pom trim, red glitter paper, new designer paper, new fabric, new dies, new punches and more. (Not only save but purchase weeks before your family and friends). 4. Be on board to offer Sale-a-Bration to your family & Friends - It begins January 25th and did you know that with each $50 purchase ANYONE gets FREE product during that promotion. 5. Changes are coming - SU will be announcing some wonderful, beneficial changes at our Leadership training in January - I KNOW great things are coming! And you'll be ready! 6. Access Stampin' Connection, our exclusive demonstrator community with over 120,000 searchable samples, hundreds of technique videos, discussion threads and more. 7. WHY NOT? - there are no required starter parties - you can simply take advantage of a great deal and walk away. And if you decide to stay, SU only asks that you submit $300 in sales per quarter - AND, did you know? - ALL of your personal purchases count. 8. You can be your own Hostess and earn Hostess benefits and extra income as well. 9. Join my team - I would be honored to be your upline! I have a large and growing team of wonderful demonstrators - Trinity Design Stampers - and support them with a Team Yahoo Group, Monthly Meeting for Stampin', Sharing and Recognition, frequent samples and creative ideas and goal setting for those who desire to grow a business. I love my team and would love to have you be a part of it! 10. Chance to earn up to 9 additional FREE stamp sets as part of Stampin' Start! 11. Chance to earn many FREE stamps during Sale-a-bration. 12. Do you want or need the opportunity to earn a side income? I am living proof that Stampin' Up! is a viable option for you. Did you know that I paid off my car payment solely with Stampin' Up! income? Did you know that I purchased my daughter's bedroom furniture with a bonus I earned from Stampin' Up!? And there are so many other stories I could share with you - but just know that it's possible! 13. THE BEST PART - Your Starter Kit is Fully Customizable! You choose the stamp sets, ink pads, cardstock, markers, ribbon, designer paper that YOU want! Is it long and do you keep adding to it? This is the best way to make your WISH List a REALITY! Here is a list of the Standard Starter Kit Items. Remember - you can select it as is, OR choose your own favorites! You can choose any or all of those great stampin' products or select others of equal or lesser value! It's Truly Customizable! These Items come with every starter kit and are Stampin' Necessities! 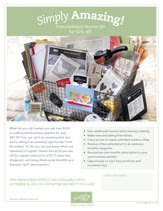 PLUS - You receive a Basic Package of Business Supplies that includes 8 Idea Book/Catalogs that are valued at 9.95 each! The actual VALUE of the Starter Kit is over $310!! And you get it ALL for Just $87.50! But, only between November 15th - 30th, so don't wait too long and miss out! There is much information there for you to read through and consider. But if you want to look at the Starter Kit Order Form and play with your choices, simply click the JOIN NOW button on the left hand side. You can go through all the screens there, completing all your information, choosing your own kit selections and just check it out - no obligation at all! My Recruiter Authorization Password is Trinitydesigns. If you do decide to try it out, simply complete the payment required and you're all set! I'll receive an e-mail letting me know that you've joined my team and will follow up with you to welcome you! Now, you've read all the way through and maybe even played around with the kit options on my website. Do you still have questions? Can I talk with you to answer them and find out - truly - if this will be a benefit to you? As a demonstrator of over 5 years with Stampin' Up! I have no greater joy as a leader to welcome new teammates. The majority of my team members joined me because they wanted to save money on the Stampin' supplies they love and they've stayed because they love being part of Stampin' Up! It's as simple as that. You have nothing to lose by taking advantage of this special opportunity and try it out. The invitation is here for you and the price is amazing! I'm looking forward to saying "Welcome to my Team!" You are truly amazing and I wish I was part of your "team"!!!! Love you and miss you!! !